In 2015-2016, IIEP-UNESCO coordinated a research project on the use and usefulness of school grants in Haiti, Madagascar, the Democratic Republic of Congo and Togo, with support from the Global Partnership for Education (GPE). In each country, the research team conducted interviews in fifteen schools. 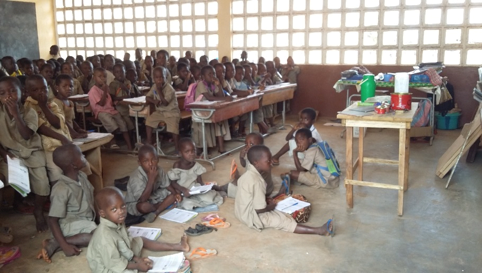 Discover here the changes brought about in the daily life of the Blue School in Togo with the introduction of school grants. The Blue School is located in a small town about twenty kilometers north of the capital of Togo, Lomé, in a suburban area. The children attending this school are from poor families who are mostly small traders and public servants. The school environment is precarious and difficult. Some teachers are forced to teach outside, under appâtâmes. Many classes are overcrowded and sometimes there are three or four students per desk. Some students sit and work on the floor oftentimes in outdoor classrooms. Since 2008, the Blue School receives school grants, it was also a recipient of the Education and Institutional Strengthening Project (PERI) grant from the World Bank, from 2010 to 2014. What have been the impact of school grants on teaching and learning conditions? First, school improvements were possible as a result of school grants. With the PERI grant, the local community was able to build a new school building in 2011 and to improve the learning environment. Today, schools grants are used to purchase textbooks and school supplies, which contribute to improve the learning conditions of students and teachers. The money is not even enough to buy the school supplies needed.The amount is insignificant. What were the changes brought about by school grants for parents? In Togo, the results have been mixed. In principal, school grants promote the policy of free primary education introduced in 1975 in Togo’s Constitution, but implemented in 2008. By law, the schools are prohibited from requesting school fees from parents. The school inspector at Tsévié told us that parent’s financial contributions are no longer allowed.But how are we going to function? There are classes with 100 children! Despite this prohibition, parents continue to contribute funds to the school budget because the school grants are insufficient. The secretary of the Parent Student Association says that these contributions are on a voluntary basis. Parents can freely contribute or not according to their means. But in reality, the majority of parents still pay fees. This produces a barrier for children to access to education from the poorest families. The parent’s fees are used for small repairs in the school or school yard. In addition, parents are also responsible to provide their children with school materials (such as notebooks, pencils and blackboards). How do school actors make decisions about how to use the school grants? Within the school, it is the School Board Committee, which includes the school’s principal, they decide how to use the funds and create a school budget.This information is shared with parents. I meet with the teachers and the School Board Committee to identify the school’s needs. Then, we call a school meeting with teachers and parents to approve the proposed budget. In the decision-making process, the parents play a more advisory role in the school and are not involved in the management of the school’s budget. As stated earlier, the director and the Parent Student Association are responsible to inform parents of the proposed spending of the budget. It is the School Board Committee that decides the use of the funds. If the director wants act on his own, then there will be a problem. If this occurs, the parents must inform us. We always remind them to do so..Who are the actors in charge internally and externally to monitor the use of the school grants? At the school level, the School principal and the accountant of the School Board Committee are in charge of the monitoring and control processes of the school grants and its spending. In this school, it’s the teacher that is responsible to supervise the use of school grants. The role of the accountant of the School Board Committee is to monitor how the grants are used. I look at the receipts and verify the purchases by date and delivery with our suppliers. The actors excluded from the monitoring and control processes are usually the parents and the Parent Student Association. These actors are usually uninformed about the school grant mechanisms. The school principal is then required to send a financial report to the accountant for verification. School visits by an external inspector are rare in remote locations because of the financial constraints of travel. In general, the school receives inspectors twice a year to verify the receipt of school grants and proper use of funds. [The inspectors] visit and ask “Can we see the rulers? Did you receive the pens? says the director. What are the strengths and challenges of school grants? Tensions and conflicts have appeared in the school since the arrival of the school grants. Parents and the community are reluctant to grant trust to the School Board Committee and the director who manage the school grants.. The parents have developed suspicion on the lack of transparence and communication on the availability and use of school grants. Despite the conflicts, the PERI school grant programme provides training on grant management to strengthen the skills of the members of the School Board Committee. In those cases, the school principal feels less isolated and more supported, while being more monitored. What have been the improvements for students? Parents agree that the grants have contributed to improved access to educationand more equity. Girls and children from the poorest households are more educated. In addition, there is a greater availability of textbooks, and children can learn in better conditions. However, some challenges remain. The school’s inspector explained that the school grant amounts are insufficient to improve schools, particularly, their quality. The grants have improved access to education, with less impact on its quality. The funds are not enough; there is always a need for classrooms, school furniture and textbooks.